Those who are fathers and parents are called to raise their children in the “discipline and instruction of the Lord” (Eph. 6:4). Husbands are to love their wives as Christ loved the church, which involves sanctifying and cleansing her with the word (Eph. 5:25-26). We are commanded to “diligently teach” the commandments of the Lord to our children (Deut. 6:7; cf. Ps. 78:5-7). We are to do this when we sit in our houses, when we walk by the way, when we lie down, and when we rise up. Diligence speaks of care, focus, purpose, and labor. That is the calling, yet sadly, many men do not lead their families in worship on a regular basis. There are many reasons for this, but one may be that they don’t know how. Therefore, we are giving some suggestions and resources to aid the men of our church in this very important duty. The outline below is merely a suggestion – you may find a different arrangement works better for you as a leader and your family as learners. Opening Prayer: This prayer is similar to the Prayer of Invocation prior to the Call to Worship during a corporate worship service. It is a prayer to ask God to bless the time. You can ask him to assist you as you lead and to assist your family as they listen. You can ask for new insights as you consider a passage out of the Scriptures, new applications, or simply to be stirred up by way of reminder. Bible Reading: Read a chapter from the Bible. We recommend that you work your way consecutively through books of the Bible (i.e. start at the first chapter of a book and read a chapter each day until you have completely the book). You can use one of the Bethel Reading Plans as a guide; these plans have a very realistic pace and allow for life’s interruptions. During personal Bible study, it is good to ask ourselves three questions: what does the passage say, what truth from the passage stood out to us, and how can we apply that truth (i.e. if I were living in light of this truth last week/month, what difference would that have made in my life)? These three questions are good questions to ask your family after reading from the word of God. Responsive Prayer: Every time the word of God is read, the Lord has just spoken (the Bible is God’s word!). Accordingly, it is fitting to give a response to what He just said. After discussing what the passage says and how to apply it, pray to God and ask him for help in the application of his word. This prayer may also involve praise, thanksgiving, or other components of prayer as well. Closing Hymn: We print the hymns for the upcoming week in the bulletin each week. You can either keep the insert from the bulletin each week, or you can view the coming week’s bulletin by visiting the Bulletins page. You can also click here view the songs from the Trinity Hymnal. You can either sing the upcoming hymns, a hymn that relates to the passage you read, or any other hymn that your heart desires. Encourage your family to pay attention to the words of the hymn as they sing them. Family worship is also a good time for catechizing your children, working on Bible memory, or praying for the saints. Catechizing: Catechizing is a profitable way of teaching our children the doctrines of the Bible (Systematic Theology). Our standards include the Westminster Shorter Catechism, and the OPC also has a Children’s Catechism for very young children. We highly encourage you to catechize your children on a regular basis. Bible Memory: The Psalmist wrote, “Your word I have treasured in my heart, that I may not sin against You” (Ps. 119:11). Regular Bible memory is a helpful tool in sanctification, and it is an important part of teaching our children the ways of God. Additional Prayer: An insert for the OPC Home and Foreign Missions are printed in the bulletin each week. We recommend incorporating prayer for missionaries into your family worship. This not only blesses the missionaries and their families, but it teaches your children to have a kingdom mindset that is bigger than our local church. 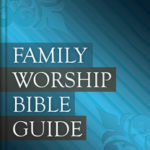 Visit the Prayer Guides page for other ideas and resouces. Some passages of the Bible are difficult to understand. If you read consecutively through books of the Bible, you will inevitably come to one which you do not understand and, therefore, will not have much to discuss. 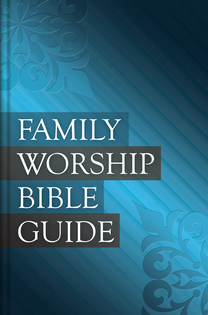 If that happens, we recommend the Family Worship Bible Guide by Gerald Bilkes, Joel Beeke, and Michael Barrett. It has a short paragraph commentary on each chapter of the Bible along with some thought provoking questions at the end. This can be a good resource to help with the more difficult sections of Scripture.